Chuan Kok is a distributor and stockist of Lame Products. Lame product range includes various types of high pressure pipe fittings in stainless steel SS316, and steel A105 material. Pressure range of the products are 3000#, 6000# and 9000#. LAME S.R.L was founded in 1961 and has been manufacturing forged steel high pressure fittings according to dimension specifications ASME B16.11, BS 3799 and outlets according to dimension specifications ASME B31.1. LAME’s core products are high pressure piping fittings which are made in carbon steel A105, and stainless steel SS316L. The products are used in the Oil and Gas industry, Petroleum and Nuclear fields. LAME has modern equipment such as CNC lathes (single and dual spindles) and special multi-head machines for high quality production. 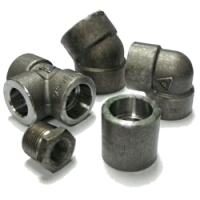 In order to provide clients with fast deliveries, large inventory of controlled raw and finished forged steel fittings are maintained. To provide our clients with quality assurance, LAME also has an internal laboratory for P.M.I. test, charpy test, mechanical yield strength test, chemical composition analysis, Upon request, LAME is also able to provide external testing services. LAME is located in Jerago con Orago, 30 km from MILANO. The manufacturing plant and offices sits on a total area of 10,000 m².